Class 3 compression (25-35 mmHg British Standard). Ultima Technology for softer, silkier and more comfortable feel. 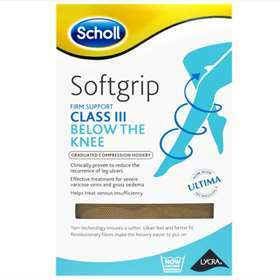 Scholl open toe option allows movement of the toes and are perfect for wearers suffering from toe conditions such as ingrowing toenails, bunions etc. To ensure the stocking lasts make sure your fingernails and toenails are free from rough edges that could snag the tights and cause ladders and holes. Remove any jewellery that could catch on the tights.